Includes a Hat, 1 Pair of Booties, and a Short Sleeved Bodysuit /Onesie. New in Box. 3 Piece Nike Air Jordan Infant Gift Set. • Great Gift Idea! Colors may appear differently on computer monitors due to brightness settings. Nike KD set. sleeveless top and shorts. boy's: 12 months. A pair of booties with matching hat. Colors are black and gray. Jumpman logo in white on hat and booties. Fabric booties with foldover style. Machine washable - Gentle Cycle lay flat dry. Machine washable - Gentle Cycle lay flat to dry. 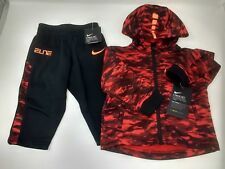 NWT NIKE BOYS ATHLETIC LIFESTYLE 2 PIECE SET HOODIE AND PANTS SIZE 4T. Red stripe down the sides. High Quality for a Great Price. New in a gift box. BODYSUIT AND CAP: 100% combed cotton. BOOTIES: 72% Cotton,26% Polyester,2% Spandex. 1 Bodysuit. 1 Pair of Booties. ITEM: 3 Piece Infant Set (0-6 Months). 1 Infant Cap. Original Nike Gift Box. New in a gift box. BODYSUIT AND CAP: 100% combed cotton. BOOTIES: 72% Cotton,26% Polyester,2% Elastane. 1 Bodysuit. 1 Pair of Booties. ITEM: 3 Piece Infant Set (6-12 months). 1 Infant Cap. New in a gift box. BODYSUIT AND CAP: 100% combed cotton. BOOTIES: 72% Cotton,26% Polyester,2% Elastane. 1 Bodysuit. 1 Pair of Booties. ITEM: 3 Piece Infant Set (6/12 Months). 1 Infant Cap. Coming from smoke free and pet free house. Cleared through the US. Your patience is greatly. 2 piece set - top and pants. outer seam 19". Color: Black and Red. Style: 653436-KR5-KF. size 24 months. to underarm; length of 14". SET INCLUDES NIKE AIR FORCE 1 BODYSUIT IN BLACK AND WHITE, MATCHING BIB AND PERFECTLY COORDINATING BOOTIES! THREE PIECE SET IS BOXED. COLORS ARE BLACK & WHITE! Nike Boys Two Piece Short Set. Futura Tricot Jacket Pants Set. Photos show actual item you will receive. 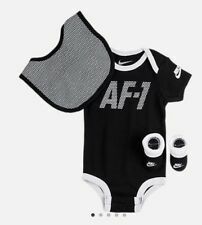 SET INCLUDES NIKE AIR FORCE 1 BODYSUIT IN BLACK AND WHITE, MATCHING BIB AND THREE SETS OF PERFECTLY COORDINATING BOOTIES! COLORS ARE BLACK, WHITE AND RED! 3 Piece Nike Gift Set - Kyrie Irving - includes Hat, 1 Pair of Booties, and a Bodysuit. • Bodysuit is Sleeveless. • Size 0-6 Months. SET INCLUDES NIKE #1 FROM THE START BODYSUIT IN BLACK, MATCHING CAP AND THREE SETS OF PERFECTLY COORDINATING BOOTIES! Adorablematching hat,bodysuit andbooties set.I love this set! Shirt has "The Last 9 Months Were My Off-Season" on front. Hat and booties have the swoosh logo on front.So cute! Colors are black, green and gray. Pair of booties with white Nike Swoosh logo. The color is black/orange, and the size is infant 0-6 months. One cap with white Nike Swoosh logo. One short sleeve bodysuit with Nike shoe box graphic on front. Jacket: Fleece Lined, Zip Front, Signature Zipper Pull, Lined Hood, 2 Hand Pockets, Swoosh. Nike Two-Piece Set. Pants: Elastic Waistband, Logo. Has a pair of blue pants with a gray/green stripe and Nike logo on thigh and a gray zip up top with blue and green trim. The outfit is 100% polyester. S & H will be FREE! Bodysuit and Cap: 100% Combed Cotton. Booties: 72% Cotton, 26% Polyester, 2% Spandex. Nike Air Jordan 3 Piece Infant Long Sleeve Set For Sale!